Many issues in healthcare are complex and the use of technology in healthcare is limited and mostly outdated. AR, VR and MR as new technologies have extreme potential for transforming healthcare. Virtual reality (VR), which can be referred to as immersive multimedia or computer-simulated reality, replicates an environment that simulates a physical presence in places in the real world or an imagined world, allowing the user to interact in that world. Augmented Reality (AR), turns the environment around you into a digital interface by placing virtual objects in the real world, in real-time. Augmented Reality can be seen through a wide variety of experiences. Mixed reality (MR), sometimes referred to as hybrid reality—is the merging of real and virtual worlds to produce new environments and visualizations where physical and digital objects co-exist and interact in real time. 2016 has been a remarkable year that’s brought continued growth and awareness to the worlds of Augmented, Virtual, and Mixed Reality. Set to become a $165 Billion dollar industry by 2020. A hybrid of both AR and VR, Mixed Reality (MR) is far more advanced than Virtual Reality because it combines the use of several types of technologies including sensors, advanced optics, and next gen computing power. All of this technology bundled into a single device will provide the user with the capability to overlay augmented holographic digital content into your real-time space, creating scenarios that are unbelievably realistic and mind-blowing. 2017 will be the start of an era that will bring some of the biggest digital advancements we have ever seen on the face of the earth for all of mankind. Through Mixed Reality we will all be able to share, experience and understand the world with a whole new set of eyes: a smarter more connected and magical set of eyes! Worldwide Revenues for Augmented and Virtual Reality Forecast to Reach $162 Billion in 2020, According to IDC; hitting critical mass in healthcare delivery, product design and management related use cases. Healthcare is one of the biggest adopters of virtual reality which encompasses surgery simulation, phobia treatment, robotic surgery, and skills training. One of the advantages of this technology is that it allows healthcare professionals to learn new skills as well as refreshing existing ones in a safe environment. Plus it allows this without causing any danger to the patients. Surgeons are regularly on the lookout for technologies that will enhance their operating environment. They are often the early adopters of technologies that allow their field to offer a better surgical and patient experience. AR and VR have changed healthcare by improving the accessibility of medical information for both professionals and patients, bringing greater visibility to complicated operations, and giving the general public more knowledge about their own health. From a business perspective, the adoption of AR and VR in medicine has opened up serious opportunities for AR/VR startups looking to get their foot in the door. The financial support of the healthcare industry is clearly beneficial for the adoption of AR and VR. AR and VR are disrupting so many different industries but the healthcare sector stands out as an early adopter where there is still serious potential for further applications. A hybrid of both AR and VR, Mixed Reality (MR) is far more advanced than Virtual Reality because it combines the use of several types of technologies including sensors, advanced optics and next gen computing power. All of this technology bundled into a single device will provide the user with the capability to overlay augmented holographic digital content into your real-time space, creating scenarios that are unbelievably realistic and mind-blowing. Mixed Reality works by scanning your physical environment and creating a 3D map of your surroundings so the device will know exactly where and how to place digital content into that space – realistically – while allowing you to interact with it using gestures. Much different than Virtual Reality where the user is immersed in a totally different world, Mixed Reality experiences invite digital content into your real-time surroundings, allowing you to interact with them. The use of transparent lenses, spatial sound, and an understanding of your physical environment will allow holograms to look, sound and behave like real objects that are able to interact with the environment around them and also with each other. Take for example the video below of Robots crashing through the walls and firing weapons at the Microsoft Hololens user. Not only mind-blowing but truly a magical experience! 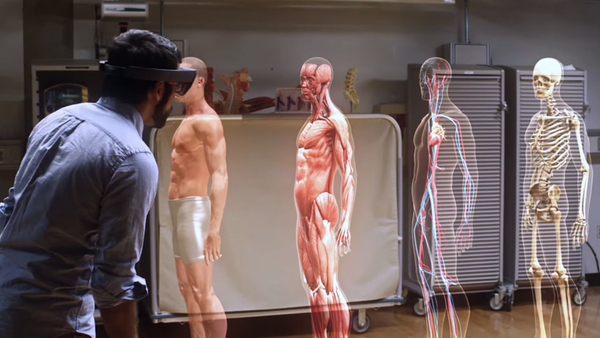 Mixed Reality will not just be another advanced gaming console to play the latest version of Halo or Madden NFL. Instead, it will add a whole new world of interactions, apps, games, and experiences we have yet to imagine. The world around you will become an entirely new canvas for you to play, learn, communicate, and interact with. 2017 will be the start of an era that will bring some of the biggest digital advancements we have ever seen on the face of the earth for all of mankind. Through Mixed Reality we will all be able to share, experience and understand the world with a whole new set of eyes: a smarter more connected and magical set of eyes! Augmented reality is one of the most promising digital technologies at present and it has the potential to change healthcare and everyday medicine completely for physicians and patients alike. Virtual reality, with its ability to fully immerse the user in a simulated environment, is a natural fit for medicine. Patients and doctors alike are thankful for anything that will increase a medical procedure’s chance of success, and the industry is one area where neither expertise nor resources are in short supply. In the US alone, the healthcare exceeded $3.24 trillion in 2015. Health is one thing everyone takes very seriously and nobody has ever argued that skimping on medical treatment is a good idea. As such, healthcare is leading the charge to widespread adoption of virtual reality. As VR, as well as mixed reality and augmented reality, continue to find a place in the mainstream public consciousness, more and more healthcare applications are developed all the time. There is a great deal of money to be made helping the sick, and it’s for a good cause, and so the top developers and innovators in technology are flocking to the industry. There are a number of ways the technology can be used to aid the healer’s craft, from training to surgery. Here are some of the most fascinating things that are happening in the space. More so than a teleconference or video feed, virtual reality has the unique ability to transport users to another place. Although communications across vast geographical distances have been available for years in the form of video conferencing and other such technologies, VR presents a way for people to truly interact with places far away. In the medical field, “interact” often means “treat” or even “operate.” Surgery is a highly specialized skill, and one of the great tragedies of modern healthcare is the lost lives that could have been saved if only the patient had had access to a better surgeon. With virtual reality, the greatest surgical specialists can treat patients all over the world, without ever stepping onto a plane. At the Centre for Surgical Invention & Innovation (CSii), Dr. Mehran Anvari became one of the very first surgeons to perform an operation with the use of a remote-controlled robot. Although Dr. Ahvari used a standard computer screen, virtual reality offers the opportunity to make this type of remote surgery even more effective. With the use of a head-mounted display and haptic gloves, a surgeon could virtually transport themselves to an operating room thousands of miles away, able to use their natural skills and senses to save lives. It seems only a matter of time before the best surgeons are able to operate all over the world without ever leaving their hospital. One area where surgeons are already plying their trade with the use of virtual reality is in training. Numerous universities, including Dartmouth and Stanford, are leveraging the new technology both for students to learn and for working professionals to keep their skills sharp. The work being done at the Standard Salisbury Robotics Lab is particularly fascinating. The researchers are utilizing haptic feedback and even “artificial patients” to help medical professionals learn. Their surgical simulation environment includes a physical model of a patient, wired to a computer simulation with a wide array of sensors. Participants in the exercise use endoscopic cameras and other tools of modern healthcare to diagnose and treat the model, and are able to see the same results on their instruments as they would if treating a real person. According to Stanford, they “experience realistic sights, sounds, and forces like they are actually in the operating room.” Their goal is to create an effective “dry run” training exercise, indistinguishable from reality. After all, what patient wants to be a surgeon’s first? One firm is leveraging VR to bring healthcare learning to the masses. Startup Medical Realities hosted the first worldwide virtual reality livestream of a surgery earlier this year, and about 50,000 people watched the event on their desktops, phones, and Gear VR head-mounted displays. This level of immersion into an actual surgery, accessible to anyone around the world, was unprecedented. The event was a success, and thankfully so was the operation itself. Medical Realities plans to host many more in months and years to come. Their hope is to allow medical professionals in all walks of life to learn from the best surgeons and doctors by literally looking through their eyes. Their next project, The Virtual Surgeon, is a series of virtual experiences recorded from the perspective of a consultant surgeon in an actual operating theater. Unlike the first streamed events, in which a 360° camera was mounted on a table next to the procedure, the camera in The Virtual Surgeon is literally attached to the head of one of the men performing the surgery. One of the most creative, innovative, and surprising uses of virtual reality in healthcare is in the treatment of phantom limb pain, or PLP. Phantom limb pain is a common syndrome suffered by amputees. Essentially, the brain has difficulty “letting go” of the severed limb. Patients suffering from the syndrome typically feel as though they are clenching the muscles, fingers, or toes of the severed limb. They are unable to “relax” the missing digits, and can experience very severe, often debilitating, pain. An article published in the industry journal Frontiers in Neuroscience detailed a study performed with the help of a phantom limb pain patient. The doctors performing the study constructed a virtual environment in which the patient had the use of his missing arm, and could use it to perform simple tasks like picking up and moving small objects. With the help of myoelectric sensors connected to the stump of the missing limb, the patient could control the virtual arm with brain impulses, exactly as the brain controls limbs in the real world. To put it more simply, he controlled a virtual arm with his mind. Given the ability to maneuver his missing arm in the virtual world, his mind was able to “relax” the muscles that no longer exist in the real world. The study also experimented with augmented reality, in which the patient wore an AR headset that would superimpose his missing limb. Both treatments were found to be effective in alleviating the symptoms and recurrence of PLP. After 10 weeks of sessions, the patient reported a significant decrease in pain, including periods in which symptoms completely disappeared. As virtual reality continues its rise to prominence in the tech world, more and more stunning applications in the healthcare field will appear. We are at the very beginnings of a technological revolution, and as ever, medicine is one of the industries that will reap the most dramatic benefits. IT analyst house IDC estimates that AR and VR will reach $162 billion in revenue by 2020, hitting critical mass in healthcare delivery, product design and management related use cases. Last month saw Oculus Rift launch in the UK and whilst the virtual reality headset has arrived with access to hundreds of gaming experiences, many are noting that the technology has opened up a wealth of opportunities in a number of fields including medicine. We’re beginning to see examples of technology like Google cardboard being implemented in real life medical emergencies – doctors in Miami used the device, combined with CD imaging to map out intricate heart surgery, saving a baby’s life. There’s still some confusion generally about the difference between AR and VR and the different uses. Augmented reality uses technology to superimpose information (such as images and sounds) on the world we see – it adds to normal reality. Whereas virtual reality creates a computer generated environment for the user to interact with and be fully immersed in – it replaces normal reality. Critical procedures is one area that VR can impact, but another is training. Medical professionals have already seen how simulations can help teach highly technical procedures that doctors rarely perform, but need to know how to do well. Technology like virtual reality offers the potential for students to experience real-world clinical situations in a way that is more immersive than training or textbooks. But will it live up to the hype? And what is the benefit of VR vs. augmented reality (AR)? Virtual reality has the potential to function as a tool to support planning surgical procedures. Currently, surgeons use preoperative imaging such as CT/ MRI scans to visualise structures, but VR could offer an opportunity to visualise 3D constructs of anatomy and pathology. In the case of removing a tumour, for example, the surgeon would be able to not only visualise it but also move around it to better understand relationships to local anatomical structures. Secondly, VR could have a role to play in helping patients to better understand their condition, the location of a tumour or cancer and what a medical procedure could entail. This could go some way to demystify a surgical procedure for patients, giving them some reassurance by helping them to understand what is going to happen. This could have a benefit in making the patient feel less anxious ahead of an operation. Touch Surgery has used VR in the setting of visualization of anatomy and pathology but more and more so our focus has become augmented reality and computer vision. Augmented reality offers Touch Surgery an opportunity to provide support for surgeons in the operating room (OR) which we find an exciting challenge. Augmented reality could also enhance the surgical workflow (the various steps involved in performing a surgery) in the OR. An example of this could be that a surgeon, if needed, can dial in an expert for support. A telesupport example is the British doctor David Nott who is remotely directing life-saving operations in war torn Aleppo via Skype. Patient self-research might also save time for various health professionals and push hospitals to adopt this type of technology. In my opinion virtual reality looks like a neat planning tool whilst augmented reality can potentially be used in the OR. AR has potential to support surgical workflow, patient safety and help create better patient outcomes. Ultimately both virtual and augmented reality offers a different way of consuming content and learning. But the technology is still expensive and developing content is challenging (particularly for AR), so it will take some time before it really impacts the everyday medical user.